Award was established in 2015 and promotes the link between Bruff and the Fitzgerald family bible. One of the most recognisable voices in the world of GAA has been awarded a famous bible award for 2016. 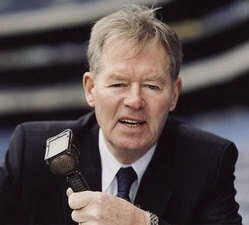 Retired RTÉ commentator, Mícheál Ó Muircheartaigh (86), is to be awarded the 2016 Fitzgerald Bible Bruff Award in County Limerick in recognition of his longstanding contribution as a broadcaster along with his work for various charities throughout the country. The award, which is organised by Bruff Heritage Group, will be presented on 22 November in the Thomas Fitzgerald Centre in the town of Bruff, following the anniversary mass for President John Fitzgerald Kennedy in SS Peter and Paul’s Church, Bruff. The Fitzgerald Family Bible Bruff Award is given to a person who makes a significant contribution to the country of Ireland through a particular act or particular service. The award was established in 2015 and promotes the link between Bruff and the Fitzgerald family bible. When Thomas Fitzgerald, who was the grandfather of former US President, John F Kennedy, left the East Limerick town in 1852, the only item he took with him was the family bible. Through generations, the bible was used by the family to record deaths, marriages and births. It played an important role in the Fitzgerald family. When John F Kennedy was being sworn in as the 35th president of the United States of America, he insisted on using the Fitzgerald Family Bible to swear the oath of office. The bible is now on exhibition in the John Fitzgerald Kennedy Presidential Library in Boston. The presentation of the award will be held in conjunction with the 2016 John Fitzgerald Kennedy Address, which is held every year on the anniversary of his death. The address will be delivered by the grandson of Seán Lemass, Seán Haughey TD.